Lenovo and VeriFone today announced the ThinkPad Mobile POS, a complete mobile point of sale (POS) platform for retail outlets built on the Lenovo ThinkPad Tablet and a custom version of VeriFone’s PAYware Mobile Enterprise for Tablet payment solution. With the ThinkPad Mobile POS, retailers can easily configure, customize and manage an end-to-end point of sale platform that delivers a more efficient and flexible alternative than stationary cash registers, helping to create new revenue opportunities for retailers, and improving the shopping experience for customers.Retailers can remotely manage the ThinkPad Mobile POS with ease, including individual device tracking, managing applications, checking status on individual units and even remotely wiping and resetting devices to minimize on-site support intervention. Built to rigorous ThinkPad MilSpec standards that characterize all ThinkPad hardware, the ThinkPad tablet offers industry-leading durability with a brilliant display, multi-touch or pen input and dual HD cameras. 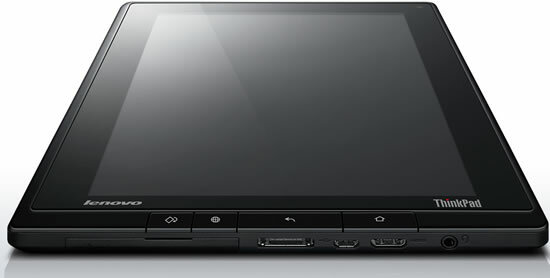 Unlike consumer tablets, Lenovo uniquely gives ThinkPad tablet users full control over the operating system, letting retailers determine what can run on the tablet and when it is updated. Coupled with an enterprise-class service and support, the ThinkPad Tablet is ideally suited to mission critical application.